A student team at the Technical University of Delft has built a hydrogen fuel cell race car with which they can "can shock and revolutionize the race world." The team has spent years developing a series of hydrogen powered race cars, culminating in the Forze VI being built this spring. 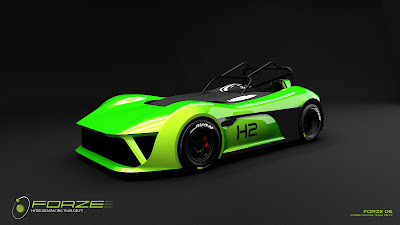 The team plans to race the car against gas powered cars in the Caterham Cup, and to take it to the Nürburgring Nordschleife to break the lap record for hydrogen powered cars. This is the car. It does 0-60 miles/hr in under 4 seconds, top speed 136 miles/hr (220 km/hr), power is 100 kiloWatts nominal, 200 kiloWatts peak, and total weight is 800 kilograms. The car has "the size of a regular street car and packs super car-ish performance" and carries six times the power of their previous car. Their write-up says the "nominal power is being produced inside the fuel cell system, which has been developed by the Forze team." It has two electric motors to drive the rear wheels independently. This setup allows for an "electric differential" where the electric motors are driven at different power levels to mimic the way a mechanical differential varies wheel RPM when going around corners. What their write-up does not explain is whether there's a battery pack, and if so what role does it play. That is, reading between the lines, "nominal power being produced by the fuel cell" sounds like the output of the fuel cell is 100 KW maximum. If so, where do they get the 200 KW peak power from? I'll send them a query to find out - but off the top of my head it's most likely that the fuel cell is used to charge a battery pack or supercapacitor bank, and that bursts of peak power can be drawn from that bank.